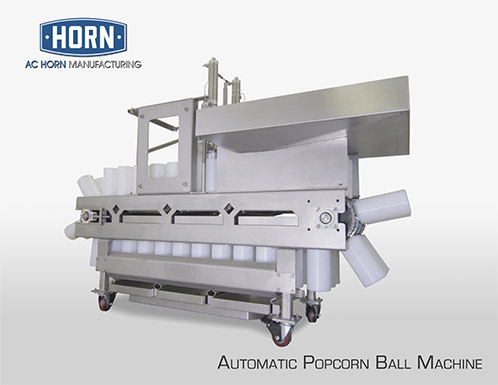 The Model M563 Popcorn Ball Machine from AC Horn Manufacturing features a PLC and servo motor drive with production speeds of up to 72 balls per minute. Frame, hopper and catch pans are constructed of stainless steel for easy sanitation. The hopper comes complete with internal heaters and product agitators. Forming cups are food grade UHMW Polyethylene. Optional forms are available for holiday shapes and different size balls. Actual final output depends upon recipe and customer process. AC Horn Manufacturing will work diligently with you to meet your company's precise processing needs. Thank you for your interest in AC Horn Manufacturing. A representative will respond to your message shortly.